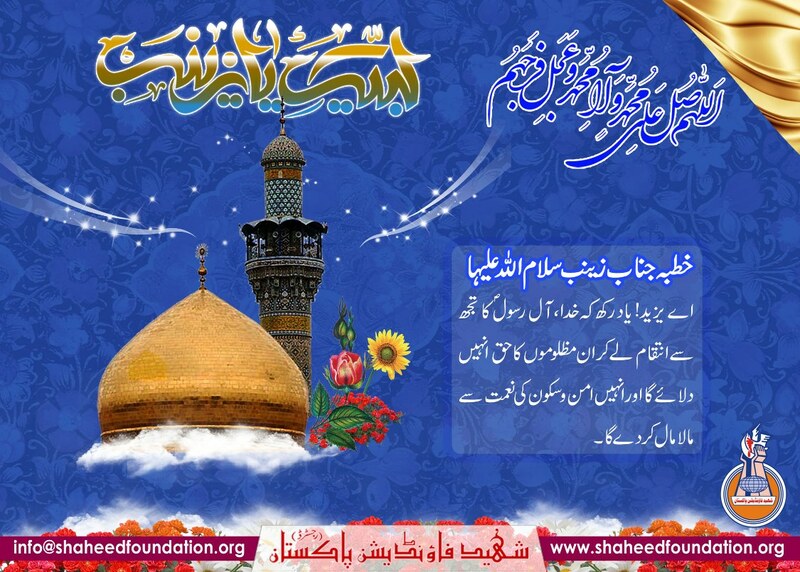 Shaheed Foundation Pakistan extends our heartiest greetings and felicitations to Holy Masoomeen AS especially Imam of our time Imam Mehdi [a.t.f.s], Rahber-e-Moazzam Ayatollah Syed Ali Hussaini Khamenei, Maraj`een-e-ezaam, Ulema-e-Karam, Khanwadgan-e-Shohada, Momineen o Mominaat, Muslimeen o Muslimaat,all the oppressed,conscientious and free thinking people of the world and the entire universe on the auspicious occasion of birth Anniversary of Sayyida Zainab Binte Ali Amir-ul-Momineen [Salamullah Alaiha]. Peace and Blessings of Allah be Upon Lady Zainab Salamullah Alaiha ,her steadfast followers and guardians[may our lives be their ransom]. She had barely attained the tender age of seven when her beloved mother passed away. Her mother's death had closely followed her cherished grandfatherÃƒÂ¢Ã¢â€šÂ¬Ã¢â€žÂ¢s passing away. Sometime later Imam Ali (AS) married Umm ul-Banin, whose devotion and piety encouraged Zaynab (AS) in her learning.